I don’t know which I like more, the beginning, the middle, or the end of a project? That’s a lie! WITH A DOUBT I LOVE…THE BEGINNING! The beginning of a project holds so much promise. Untouched lumber stacked in the shop, and an “as of yet” unchanged set of plans leaves me in an state of anticipation for how the materials will run through the machinery, and of course the inevitable textbook results of my ever-improving hand tool skills that yield perfectly cut, shaped and assembled components in no time. In fact, they’ll be so perfect I’ll have to deliberately add a blemish or two to keep it from looking factory manufactured…right? As things begin to progress, and I can anticipate the end of the project approaching, I’m already feeling project fatigue kicking in. The end of a project is a bittersweet time for me, and it’s not because I’m necessarily such a sentimental guy either. Quite honestly, as I get closer to wrapping up a build, I find myself feeling a little overwhelmed with all the little details I’ve been putting off or the ones that have to wait because they’re so crucial and I don’t want to somehow muck them up. 1/10th of the “to do” list! This usually involves something to do with the finish, or the hardware. But regardless of what it is, it’s the LONG LIST of small details and touch-up work that’s the bane of my existence in the woodshop. Of course, as soon as the list is completed and the project is in its final location I’m ready to dive into the next project with all the zeal and gusto I felt previously…even though I know I’ll end up bogged down in this “end of project quagmire” again. I told you mine, now which is your project timeline bane? The beginning, the middle, or the end? The begging and the end LOL! I over plan and often get paralyzed by to much analysis and then I get to the end and like you seems like I can never get all the lose ends wrapped up. The middle is the sweet spot for me. I am ALL about the middle! What is this “end” you speak of? Adapt and overcome, its just that the punch list is never really ending as I loose interest and move on. End details are scary so I think I’ll just rework storage in my tool cabinet again instead. chortle! rearranging is good planning! I found that taking that list of small details and concentrating on doing one a day until they are all done, works. And, if knowing I’ll just be doing that one detail for the day, I can really Zen-in on it. I’m with you on beginnings, all excitement there. I have a tough spot in the middle – usually associated with sanding. 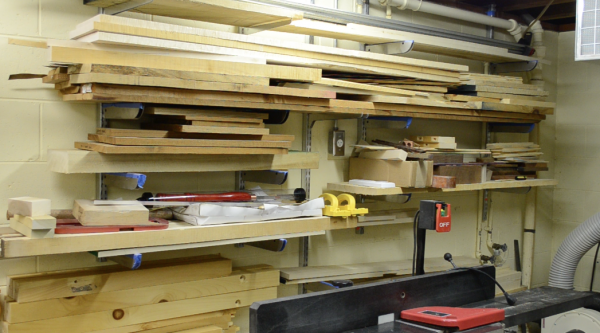 I do kitchens, and my shop is not huge, so somewhere around the 3/4 mark, I get really tired of playing 3D Tetris with cabinets in an attempt to maintain a functional work space. Always, always, at this point I’m so ready to be done. Then spraying comes along, and things pick up a again. The final details and the install don’t drag me down, as I get to see the RESULTS of that incessant sanding and prep. I like watching the details (wood choice, crown mouldings, flooring, counter tops, backsplash) come together. Backsplash is always last, and no kitchen looks even remotely finished until it’s done. I think the middle. After all of the parts are cut I stumble on the right order of assembly sometimes. Oh wait! No it’s the finishing, just remembered I finished putting together a garden bench a month ago but it can’t go outside until I put some poly on it. Well then again sometime I freeze trying to get the party started, not sure how I want it to come out or how to do certain techniques. Now, what was the questions again? I love the planning and design phase. In my mind I can build the most elaborate new fangled best things ever. Least favorite time is at the tablesaw. Just too loud and repetitive. For me, it’s the middle I don’t like. 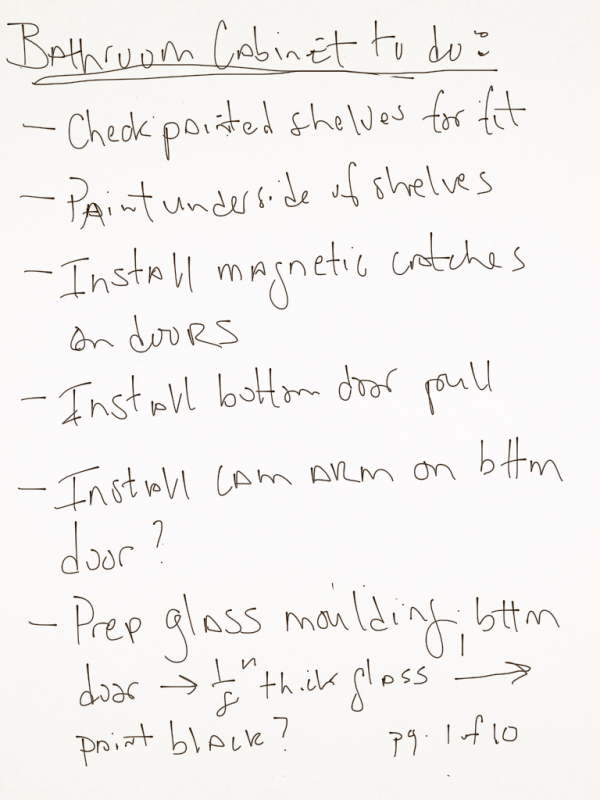 You mentioned all the prep work for the final finishing, the list shows installation of a cam, and prepping glass. To me, that’s all middle work. 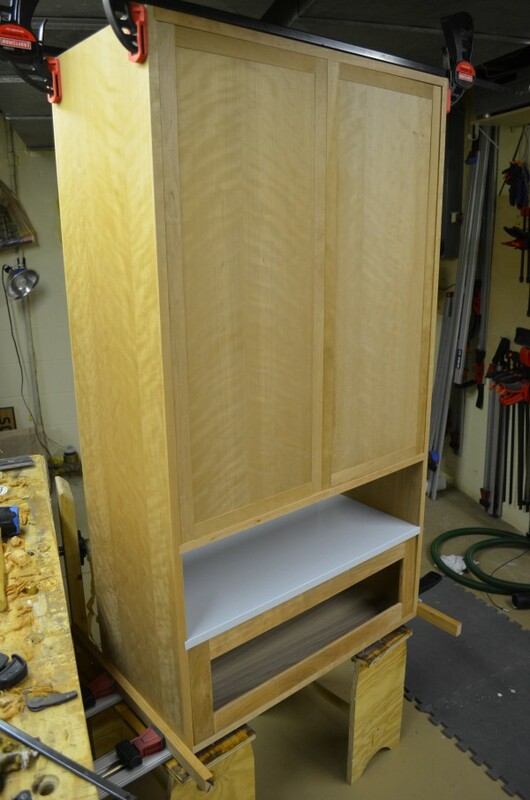 Final work is when you finally apply the finish (not necessarily something that is only done at the end), when you install the pulls and knobs, and when you install the cabinet in its final resting place. Middle is where all the details start to come clear, finesse needs to be done, and the basic assembly has either just begun or is about to start. The beginning is nice, full of hopes and dreams, full of anticipation. Goals conflict with finances and current shop supplies, client wishes conflict with production capacity, and the springs on the car are refreshed and ready to carry stock. The end is when the client looks over the final project, the project gets out of the shop, and the dust finally gets cleaned up. The middle is where the work gets done.